In the mountains of Tibet lost an amazing country with the same name. In fact, Tibet is part of Chinese Republic, but it is very difficult to call it just a Chinese province. This is a separate state with its own language, cultural traditions and religion, so original and incredible that it seems an enclave of another world, a mystical and mysterious. For a long time Tibet was closed to foreigners, but fortunately, in 1984 the ban was lifted, and the foothills of the Himalayas revealed to the world the rich culture and history of this ancient country. However to get here is still quite difficult. 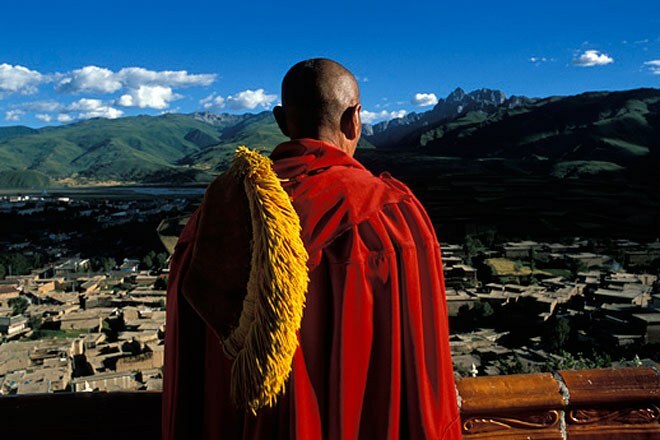 In order to enter the territory of Tibet, you must obtain permission from a special Bureau, and it is not so easy. The accompaniment of a licensed guide is mandatory stay in the area. In addition, laws on the entry of foreign tourists is so unstable and changeable that at times here don't let anyone but the Chinese. The road to Tibet can be actually via China or via Nepal. Not cheap, the average price of travel from Nepal – $ 1,000. Will have to issue the permit – a special permit and group visa, one in Tibet can not get, only with a group. Visa is a state within a state shall be selected, not the one in China, so it makes sense to have 2 documents. The capital of Tibet – Lhasa. To get to this Alpine oasis, you can travel from any relatively large Chinese city. Can be reached by car, winding along the serpentine mountain, there are even guided Hiking transitions. And recently was completed on a real "highway to heaven." It is a nickname already given Cengizkoy the railway linking China plain with altitudes of Tibet. The canvas runs along the picturesque route, opening a view of the overflowing Brahmaputra and mountains. And in addition, the journey on this train will save travel time from the province of Shigatse in the Tibetan capital, since it is only a couple of hours. On arrival in Lhasa the journey does not end, but rather only the beginning, because there are many monasteries that you should visit. Religion has an important place in the life of Tibetans, so the road to Tibet can be considered not only physical movement, but also a path of spiritual enlightenment. High in the mountains there are many churches, Hindu and Buddhist, monasteries, religious schools and ancient sources of power, to touch which the greatest happiness. Oddly enough, the Tibetan rites is also associated with the road, with all kinds of walking. For example, local nature sanctuary, mount Kailasa, is chosen for the bark - rite of purification from all sins, which is achieved by the Cycling bypass of the sacred mountain. Day and night the Tibetans and pilgrims walk around the main Buddhist shrines. And somewhere here begins the journey to the mystical Shambhala, a legendary portal to another dimension. Obviously Tibet is the crossroads of the worlds, and roads where everyone can choose the path to their liking.